The Saudi-led air strikes on Yemen have failed to stem the Houthi advance. Time for jaw-jaw, not war-war. 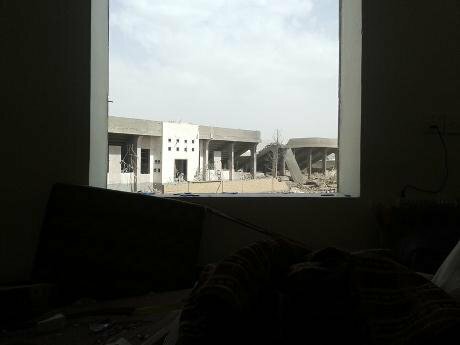 Hardly surgical: a view from a window overlooking the Al Yarmook football stadium in north Sana'a, hit by a Saudi air strike on the al-Rawthah neighbourhood yesterday. Demotix / Alhussain Albukhaiti. All rights reserved. It’s difficult to envisage an end-game to the conflict in Yemen, the Arab world’s poorest country, where on 25 March a coalition of states led by Saudi Arabia began air strikes which have killed dozens so far, including unnumbered civilians. The targets are Houthi tribesmen, armed Shias who have swept across Yemen from their heartland in Saada, along the Saudi border, to the southern port city of Aden, taking the capital, Sana’a, in September and the key Red Sea coastal city of Hodeida, among others. The Houthis’ remarkable territorial gains caught Saudi Arabia and its allies by surprise, instilling fears in the Sunni monarchies that Houthi-supporting Iran was rapidly spreading its influence across the region. Such fears were compounded by declarations by Iranian lawmakers, following the fall of Sana’a, that Iran now controlled its fourth Arab capital—after Baghdad, Beirut and Damascus. Saudi Arabia, which previously bombed the Houthis in Saada in 2009-10, has reasons to be concerned. The Houthis’ policies largely align with those of Tehran, which supplies diplomatic, political and, most likely, military assistance and recently signed an ‘economic partnership’ agreement. Riyadh does not want an antagonistic, Iranian-supported group dominating its southern border. Lebanon’s Hizbullah provides a worrying reference point. A formidable Iranian proxy, the group has an arsenal comparable to the armies of nation-states and is a worthy adversary for the Israel Defence Forces, one of the most powerful armies on the planet. Riyadh does not want the Houthis to be a thorn in its side the way Hizbullah has been to Jerusalem; Hizbullah’s mere presence influences Israeli foreign policy and arguably acts as a deterrent against a strike on Iran. But the Houthis are not, nor are likely to be, akin to Hizbullah. Houthi policy is not directed by Tehran, they do not subscribe to Wilayat al-Faqih (the doctrine that Islamic jurists should rule) and they differ ideologically with the Iranian mullahs (who follower the Twelver form of Shia, whereas the Houthis are Zaydis)—they are supported by Iran but not a proxy. Yet a pro-Iranian group controlling Yemen crosses a red line for Riyadh, with the nightmare scenario of Iranian long-range missiles being installed, targeted at key installations in the kingdom. The Saudis calculate that without their intervention the Houthis would have even less incentive to halt their advance. The latter have systematically ignored Security Council calls for a cessation of violence and adherence to the UN-supervised political transition, and rejected calls for negotiations. Yet extraction from a conflict is extremely difficult and very costly, as US-led coalitions in the Middle East in the past decade have palpably demonstrated. And whereas hitherto in Yemen, regional powers supported local allies remotely, in an active war Saudi Arabia’s reputation, in particular, comes on the line: the coalition cannot end its operation without a clear ‘win’ of some sort. But right now a ‘win’ for Saudi Arabia looks highly unlikely. Since the air strikes began, the Houthis have pushed on into Aden, where they are embroiled in street battles with resistance fighters. The prospect of their securing control over Yemen’s second city (and capital of former Southern Yemen) is fuelling speculation that Saudi Arabia or others in the coalition will commit ground troops. But the Houthis are not, nor are likely to be, akin to Hizbullah. This, of course, would be highly risky. In unfamiliar territory against battle-hardened Houthis, Saudi or coalition forces would almost certainly suffer casualties. This would raise the stakes even further and make withdrawal very difficult. Meanwhile, Iran has upped the ante in recent days, by sending two military vessels off the Yemeni coast, purportedly to "safeguard naval routes for vessels in the region", and through the cutting words of its supreme leader, Ayatollah Ali Khamenei—who called the Saudi-led intervention a “genocide” akin to Israeli strikes on Gaza. The stated aim of the Saudi-led operation is to bring the Houthis back to the negotiating table and restore the transition process, halted when they overran Sana’a. Leave aside the improbability of early success. What next? Who would the Saudis support to hold the loose reigns of power in Yemen? Having committed its forces, Riyadh almost certainly intends retaining leverage in Sana’a and, ideally, keeping the country within its sphere of influence. Indeed the Saudi defence minister and son of the king, Mohammed Bin Salman, was quoted by the state-owned TV, Al Arabiya, as favouring the reinstatement of the president, Abd-Rabbu Mansour Hadi, effectively ousted by the Houthis. But they have said they will not accept Hadi’s return and any peace initiative lacking Houthi support looks doomed to fail. Other options also appear unpalatable. Ahmed Saleh, son of Yemen’s wily former president (Ali Abdullah) and now an unlikely ally of the Houthis, will not get the coalition’s backing, while Islah, Yemen’s Muslim Brotherhood affiliate whose relations with Saudi Arabia appear to be thawing since Salman took over as king, are bitter Houthi enemies. Ali Nasir Muhammed, former president of South Yemen before unification in 1990, has been lobbying in Riyadh but without any sign of success. Even though the Houthis reportedly claim to be ‘ready’ to return to the negotiating table, on condition that air strikes are ceased and negotiations are overseen by ‘non-aggressive’ parties, there is no evidence that a ceasefire looms. This not only means that the dire humanitarian situation will worsen for millions—particularly as the coalition air and naval blockade continues to prevent or slow food imports (Yemen imports 90% of its foodstuffs)—but it plays into the hands of al-Qaeda in the Arabian Peninsula (AQAP). The group, deemed al-Qaeda’s most dangerous branch by the United States, has already taken advantage of the conflict. In the past week it took control of the port town of Mukallah, securing the release of almost 300 inmates from a jail which housed the leading AQAP operative Khalid Batarfi. Another tragic outcome of this war is the entrenchment of old divides and the emergence of new ones. Divisions between northerners and southerners—the country was partitioned for over 22 years—are growing, making a stable, unified state less likely. Sectarianism, never seriously present in Yemen, is fast becoming a reality, as in Syria and Iraq. And with the militarisation of children as a consequence of the conflict—the UN estimates that almost a third of fighters are children—the repercussions are likely to be felt for decades to come. Many fear the time for dialogue has passed, yet it must be pursued. Iran, the US and other coalition members certainly have key roles to play, but Saudi Arabia is best placed to take steps that can bring the Houthis to the table. A halt to air strikes, on condition the Houthis agree to a ceasefire, is an obvious first step. Riyadh should also agree to drop demands for Hadi to return to power—not only have the Houthis utterly rejected this but he has proven an ineffective leader and does not enjoy widespread support. And it must accept that the Houthis will become major political players in Yemen and be granted more power than they were accorded through the National Dialogue. However difficult these compromises might seem to the Saudis, this is the only possible route back to relative stability. They might not score the ‘win’ they hope for, but it is much better than the alternative.